Leading up to the opening match of this year’s World Cup in the raucous, yellow, partying, poor, and rich nation of Brazil, I discovered the underground phenomenon of sports betting. I cannot go into too much detail about this shady activity, which might be illegal in the state I live in? But needless to say, the discovery has changed and enhanced my experience of today’s introductory and controversial match. The bad calls and possible corruption controversies from the last World Cup (ahem, Frank Lampard’s evaporated goal against Germany) are out and we can now sit back and enjoy the beautiful game in its purest form with only the true bounces of the ball and skill of the players deciding winners and losers. Right? Well, no, not exactly. Going into the match, with my computer screen showing all of the betting options before me—Argentina wins the tournament but Christiano Ronaldo is leading scorer: 50-1 odds, Karim Benzema scores the most goals: 120-1 odds, Columbia and Greece advance from Group C in that order: 9-2 odds–it was all a bit overwhelming, and I didn’t know what to do so I almost left the site without putting any of my hard-earned (well, some of it is hard-earned) money on the line. But sports betting is just too fun! That’s why, like some other fun…stuff…it is illegal. I ended up scanning through pages of different betting options until I knew I had to put dough on my favorite player, the young Brazilian hipster goal-scoring phenom, Neymar. I bet 10$ at 10-1 odds that he would score the most goals in the tournament. I mean come on, this guy is the friggin Jesus Christ of his country, the savior sent from the Lord to return the people of Brazil to the righteous path of World Soccer dominance, and he has such flare! His Dad is one of his best friends, and Neymar Sr. gives Junior a pep talk before every game. His speech in this commercial is epic, as are all the other stars’ and peoples’ pregame rituals. But the focus is on the man who wears his name iconically on his flatbrim. The question was: Could this maturing striker of the ball, this budding fashion icon, this precocious superstar, deliver for his country in their opening match of the first World Cup they were hosting since 1950? If history repeats itself and my math is correct Brazil won’t host another World Cup until around 2078, at which time my five-year old cousin will be 69 and Ronaldo will probably be dead. Winning Now, matters. And the burden of this nonnegotiable success rests squarely, or perhaps pointedly on Neymar’s bony shoulders. Could he begin the quest with a bang? The answer was a resounding YES. But first, the red carpet opening Neymar and Brazil may have expected was swept from under their feet by…Brazilian midfielder Marcelo? To be fair, Croatia created the eventual own goal with great outside movement and a sharp cross into the middle that Marcelo finished into his own net with a display of accuracy and precision that no American striker has shown us since…Well, anyway, it was the tenth minute, and the country of Brazil was as shocked as an Amazonian piranha stranded out of water and getting electrocuted. It was time for Junior to heed his father’s (or God’s?) message and not hold back. Beat drop. 29th minute. Neymar dribbles through the center of the Croatian midfield and unleashes a left-footed zinger that probably could have been saved but wasn’t, bouncing off the right post into the back of the net. Our Lord has risen (Too much? Yes.) The star is in the building. A country has arrived. Our young hero celebrating his first ever World Cup goal. The rest of the match contained plenty of controversy up until the final whistle. I’m not sure how World Cup refereeing works, but I wouldn’t be surprised to see an image of referee Yuichi Nishimura flashing Richard Nixon peace signs before stepping onto a jet chartered to take him back from whence he came. He did not perform up to par, and it cost Croatia a possible result against the tourney hosts and favorites. In the 71st minute, Fred performed his best imitation of a Portugese dïve. Like colonizer, like colonized. Fred’s antics deserved a PK according to Mr. Nishimura, who was just plain wrong, and the penalty was barely scored by the star-crossed player (or perhaps star-crossed lover with his country or destiny as the…other…lover? Perhaps I should settle down about Neymar). On both of the young Brazilian’s goals, Croatian keeper Stipe Pletikosa, will believe he could have done better to protect his net. But it’s got to be hard with tens of thousands of madly dancing and singing Brazilians spiritually willing the ball over the line. For those of us who find religion and spirituality intriguing but not exactly “real,” when Neymar Sr. in the commercial says: “put God’s army in front of you” to his son, we think he might just mean the rowdy fans in the stadium, the kids playing futsal in the tattered streets of Rio, the country that demands glory. Put them before you son, and deliver. But Neymar is not alone, and even with two goals, he was not the best player on the pitch today, relinquishing that distinction to teammate Oscar, whose majestic dribbling and passing was rewarded with a stoppage time toe-poke goal to make the final score 3-1. Once again unfortunately, the play started with a suspect Brazilian tackle that could easily have been a card and free kick going the other way rather than a goal, and that wasn’t all. Between Neymar’s PK and Oscar’s cherry atop the cake, Croatia was denied an equalizer when striker Ivica Olic was called for a questionable foul on Brazilian keeper Julio César, as he knocked the ball loose in front of the net for an easy finish. These repeated bad and missed calls prompted my pessimistic father to cry corruption and claim that all World Cup matches are fixed like the Mexican police force or any routine Italian sporting or political event. I don’t want to believe it. 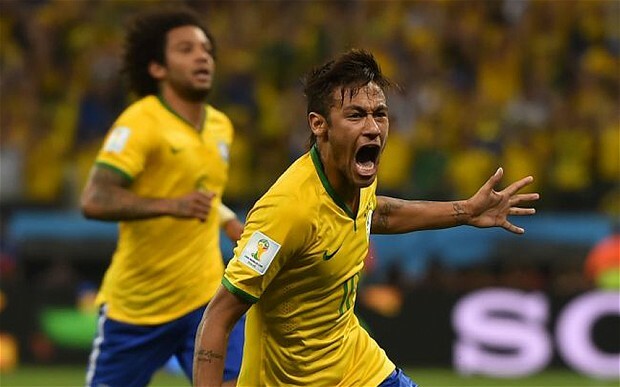 I want to believe that my hero Neymar and the force-for-good team around him is winning fairly. I want to believe that when Neymar scores the most goals in this World Cup I will win my money fairly. (In case you forgot, I stand to win $100). I also put a dollar down on Jozy Altidore, because we have to support our guy! Odds he scores the most goals: 150/1. Bad calls and angry hideous Croatians aside, it was a great first day for the 2014 World Cup. Stay tuned for more inspirational videos and Neymar gushing. Wear God’s Armor…Go with God…God Bless You. Thank you Mr. Neymar!